School sports are in full swing and while head injuries can happen in any sports, football and soccer are two of the sports in which concussions most commonly occur. The significance of head injuries in sports was often under-appreciated. What was previously described as a harmless “ding” or “getting your bell rung” is now understood to be a concussion. With rule changes recently implemented at the professional levels and a few poignant severe cases in high-profile athletes, there is an improved awareness about concussion. The Sports Concussion Clinic in the Children's Orthopaedic Center at Children's Hospital Los Angeles offers a comprehensive team of experts to care for your child and answer any questions parents may have. Prompt medical appointments to evaluate your child soon after a concussion. Consultation by our concussion team to determine appropriate, safe and timely return to sports. Multidisciplinary team of Board-Certified experts in sports medicine, neuropsychology, neurosurgery, rehabilitation and more. Coordination of care with primary care providers, school personnel, coaches, athletic trainers and other relevant personnel. A concussion is a mild injury to the brain that disrupts how the brain normally works. Concussions are caused by a hit or jolt to the head that causes the brain to move around inside the skull; this may be a direct hit or just a quick change in motion that causes the head to rotate quickly. Sometimes the actual event may not even be recalled by the athlete or be noticed by witnesses. How Do I Know If My Child Sustained a Concussion? While the list of possible symptoms is long, even the presence of one or two symptoms in the setting of sports participation (practice, games or casual play) should raise suspicion of a possible concussion. If you have any concern a concussion may have occurred, it’s important to get it checked out by a physician with experience in concussion care. Rest! Rest! Rest! Rest truly is the best medicine when it comes to concussion. After a concussion, being more tired than usual is normal so let your child go to bed early, sleep in and take naps. Rest includes a break from all exercise and athletic activity as well as cognitive rest. Cognitive rest means giving the brain a break from thinking. That means no texting, computer time, email, phone calls, video games or loud music/television. Additionally, kids may need to even stay home from school and definitely refrain from intense studying or reading. Concentrating and paying attention can be a challenge after a concussion, so as your child starts to feel better and is ready to begin some schoolwork start slowly with short intervals of studying (30 minutes or less) at a time. Taking breaks is essential to avoid over-working the brain and causing a recurrence or worsening of symptoms. Being observant of resting right after a concussion will enable the speediest recovery and return to sports possible. Your doctor, who is experienced in treating concussions, can help you determine when your child is ready to return to school work and sports. Do I need to wake up my child in their sleep if he/she has a concussion? No, as long as your young athlete has been behaving normally, eating well and not demonstrating any “severe symptoms” prior to going to sleep then it is best to let your young athlete sleep. Rest is the number one best remedy for concussion so it’s best if we don’t interfere with it. 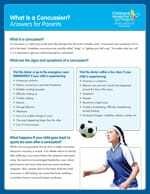 When can my child return to his/her sport after a concussion? Once all the symptoms are gone, a doctor will evaluate your young athlete and determine readiness for return to school and sports. For most athletes with mild concussions, symptoms resolve within seven to 10 days but all athletes and injuries are unique. The doctor will evaluate your child with tests of memory, concentration, balance and more. What happens if my child goes back to sports too soon after a concussion? While most young people recover from a single concussion, everyone’s recovery occurs at their own rate. If an athlete returns to activity before the symptoms have gone away, concussions can result in prolonged headaches, poor school performance and many other post-concussive syndrome symptoms. Also, another blow to the head while the initial concussion is still healing can occasionally result in fatal brain swelling—a condition known as second impact syndrome. When in doubt, sit out: If you think you're young athlete may have had a concussion, get it checked out by a doctor before letting your young athlete go back to activity. Use correct technique in sports: Don't hit "head first" in football. Don't head the ball with elbows up in soccer. Make sure your young athlete has appropriate neck strength before heading the ball in soccer or making a football tackle. Use safety measures well: Make sure pads are appropriately positioned on goal posts, helmets are well-fitting and soccer balls are the appropriate size and inflation.